Gloria Dei traces its roots to the church on Tinicum Island that was dedicated in 1646 by the distinguished missionary, Johannes Campanius. His translation of Martin Luther's Small Catechism is the very first book published in the Algonquin language, and his work among native Americams was the first attempt by anyone in the original thirteen colonies to spread the Gospel among the native peoples. An existing blockhouse at Wicaco, (South Philadelphia) was renovated for worship in 1677, and both sites were used for worship until the present building on the Wicaco site was consecrated on the First Sunday after Trinity, July 2, 1700. 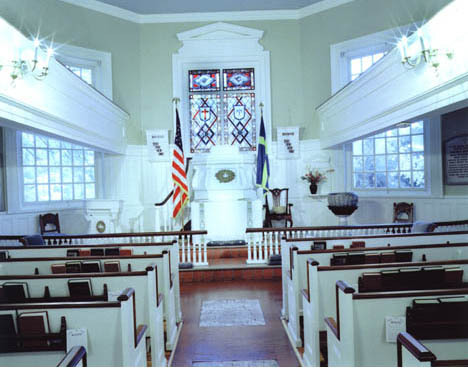 It is the oldest church in Pennsylvania and a National Historic site. The north (sacristy) porch and south (storage) were added in 1704 to strenghten the walls of the nave. 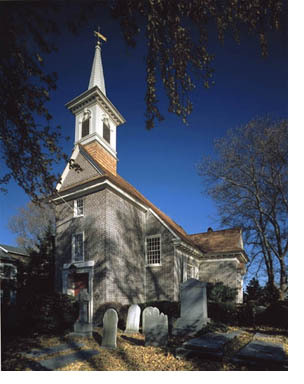 As one of the two original congregations, its pastors were responsible for the founding of St. Gabriel's Douglassville, and were united with two "annexes" until 1843 - Christ Church, Upper Merion and St. James, Kinsessing. The congregation grew substantially during the ministry of the nobleman and revival preacher, Dr. Carl Magnus Wrangel (1759-1768). He is known to have baptized over 20 Africans as members of Gloria Dei, making it one of the first multiracial congregations in the country. He also translated and published Martin Luther's Small Catechism in English for the instruction of youth and adults (1761). The bell in the steeple comes from the original Tinicum congregation; although it has been recast. The carved Angels with an open Bible now located below the organ are also thought to be from the Tinicum structure. The left-hand inscription is from Isaiah 9:2 in the 1618 Gustaf II Adolf translation: "The People who walked in darkness have seen a great light, those who dwelt in a land of deep darkness, on them has light shined" - the traditional lesson read at Christmas morning dawn (Matins Julotta) and the other is "Glory to God in the highest" - the song of the angels to the shepards (Luke2:14) that is the usual canticle sung at every Swedish High Mass. The massive Swedish-style marble baptismal font was crafted in Philadelphia in 1731. It is one of the oldest fonts in continual use in the country. The original altar painting by Gustaf Hesselius (a member of the congregation and famed portrait painter) seems to have disappeared during the Revolutionary War. It was dedicated on Pentecost Sunday, June, 1715, and would be the oldest publicly commissioned artwork in the 13 colonies if it had survived. The last Swedish priest on the Delaware was Nils Collin who served at Gloria Dei until his death in 1831. A former assistant, Jehu Curtis Clay, the first Episcopal priest to lead the congregation, gained many new members and brought it into the Episcopal Diocese of Pennsylvania (1845). The original rectory was at Point Breeze on the Schuylkill. It was replaced at the present site in 1737, and a rectory was built in the same location along with a sexton's house in the 1830's. The present side balconies, stained glass window, painting scheme, and center pulpit date from a major renovation in 1846. At the same time, the present floor was installed. The Parish Hall was built in 1863. Snyder Binns Simes became rector in 1868 and served for 47 years. The Roak House was added in 1969 - named after John Craig Roak who served from 1933 until 1972. It houses offices and meeting spaces. At present, a major renovation is underway to mark the 300th Anniversary in the year 2000. Although Gloria Dei probably had one of the first pipe organs in the country, none of it remains. However, a major source of joy is the Hook and Hastings Organ that was built in Boston by one of the country's best builders and dedicated in 1903. It was renovated in 1993. Jenny Lind sang here during one of her famed America tours. Gloria Dei was also the site of the first regular Lutheran ordination in the Western hemisphere: Justus Falckner, a German Theology student was ordained in 1703 to serve Lutherans in New York. Acting for the Archbishop of Uppsala, the three Swedish priests: Rudman, Sandel, and Björk, consecrated him a priest. This was probably the first episcopally authorized Christian ordination in the Colonies since most other Christians obtained their clergy from Europe. Hanging in the center aisle is a Swedish chandelier given by famous artist, Carl Milles, a Swedish wooden angel (Gabriel, an exact replica of an 11th Century original from Gothenburg) and ship models of the two pinnaces that brought the Swedes to America in 1638 - the Kalmar Nyckel and Fogel Grip. Recollections of many Swedish royal and episcopal visits are treasured memories. In the cemetery are numerous ancient graves including Alexander Wilson, father of American ornithology, Revolutionary War soldiers, and Amandus Johnson, the famed Swedish-American scholar and founder of the American Swedish Historical Museum. The Church of Sweden continues to hold monthly Eucharists here supplied by priests of New York City congregations for the Delaware Valley expatriate community.